The Drug Enforcement Administration through the Drug Disposal Act safely collects and disposes of pharmaceutical controlled substances. DEA’s National Prescription Drug Take-Back Day, April 27, 10 am to 2 pm, is a safe, convenient, responsible way to dispose of expired or unused prescription drugs. 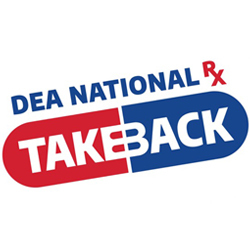 Visit DEA’s official website, takebackday.dea.gov and enter your zip code in the Collection Site Locator. The 2018 Take-Back Day brought in more than 900,000 pounds of unused or expired prescription medication. The total amount of prescription drugs collected by DEA since the fall of 2010 is 10,878,950 pounds. According to the National Institute on Drug Abuse, Misuse of Prescription Drugs study, January 2018: “More than 80% of older patients (aged 57 to 85) use at least one prescription medication on a daily basis, with more than 50% taking more than five medications or supplements daily.” Consumers and caregivers should remove expired, unwanted or unused medicines from the home as soon as possible to help reduce the chance that others may accidentally take or intentionally misuse the unneeded medicine. Only ultimate users are legally allowed to dispose of pharmaceutical controlled substances. An ultimate user is defined as the person or the household member of the person who was prescribed the medication. The ultimate user may transfer the substances to authorized collectors or law enforcement via a collection receptacle, mail-back page or take-back event. Then the drugs are securely stored and may not be resold. The most common method of rendering the drugs non-retrievable is incineration. By disposing of pharmaceutical controlled substances properly, fewer of these substances end up in our nation’s water system. If National Prescription Drug Take-Back Day is inconvenient, call the DEA’s Registration Call Center at 1-800-882-9539 to find another collection location near you. Always properly discard unused or expired medications by following FDA guidelines at FDA.gov, Where and How to Dispose of Unused Medicines.